Born in Madrid Spain, David Sanchez Burr, currently lives and works in Las Vegas as a mixed-media artist. Having attended Virginia Commonwealth University in Richmond, Virginia, Sanchez Burr began his first experiemental work with sound and visuals that would later evolve into his current practise which involves the study of materials' physical responses to the elements and natural processes. Sanchez Burr is interested natural decay, entropic forces and the intrusion of human social systems in these processes, as a result his artworks are designed to be in a constant state of change. 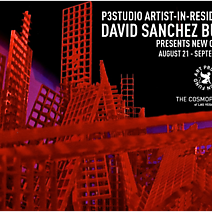 Sanchez Burr's mediums range from installation art, performance, sculpture, video and sound art. His recent exhibits include a solo exhibition at the Clark County Government Center in Las Vegas Nevada and Memphis Social an Apexart franchise exhibition in Memphis Tennessee.